You may never see a headline that reads “House Cat Maims Woman” or “Man Hospitalized after Run-in with Stray Kitty.” Make no mistake: that doesn't mean cat bites are harmless. In fact, a seemingly innocent bite from a feline may well be more dangerous than a vicious dog bite. It's that deceptively benign quality that makes a Missouri feline bite so potentially dangerous. While the victim may think it's just a harmless bite, what's below the surface may cause serious damage. Most cat bites are puncture wounds. As such, it's easy for the victim of a cat bite to assume that the injury is nothing but a little mark. However, while the bite may not cover a large surface area of the skin, the length and sharpness of a cat's teeth typically means the teeth go deeper into the skin than you might suspect. The narrow but deep bite of a cat has the potential to damage internal tissue, nerves, and even bones. Conservative estimates say that half of all Missouri cat bites result in infection. Cats carry numerous bacteria. In fact, one case study showed more than 100 different bacteria strains in just one cat bite! Bartonella is a particularly dangerous type of bacteria that most cats carry. Unfortunately, infection is not easy to spot right away. In fact, the outside puncture wound may heal over quickly while the internal damage may just be starting. This is why doctors strongly urge people to make an appointment any time they are bit by a cat. If a cat has bitten you or a family member, the injury may be more serious than you think. Call a doctor to check for any signs of infection or internal damage. If the injury is serious, you may also want to speak with an experienced St. Louis animal bite lawyer. 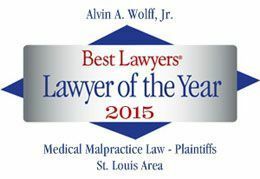 For a free consultation or to request a copy of Guide on How to Pick a Lawyer, call Alvin Wolff at 314-241-2500.